TruthUnity Note: Click here to watch a 51-minute video of Ed Rabel commenting on Finding The Christ In Ourselves. THROUGHOUT all His teachings, Jesus tried to show those who listened to him, how he was related to the Father, and to teach them that they were related to the same Father in exactly the same way. Over and over again he tried in different ways to explain to them that God lived within them, that he was a “God of the living and not of the dead.” And never once did he assume to do anything as of himself, always saying: “Of mine own self I can do nothing. The Father that dwelleth in me, he doeth the works.” But it was very hard then for people to understand, just as it is very hard for us to understand today. Let us suppose a beautiful fountain which is supplied from some hidden, but inexhaustible source. At its center it is full of strong, vigorous life, bubbling up continually with great activity, while out around the circumference the water is so nearly motionless as to have become impure and covered with scum. This exactly represents man. He is composed of a substance infinitely more subtle, more real than water. “We are also His offspring.” Man is the offspring—or the springing forth into visibility—of God the Father. At the center he is pure Spirit, made in the image and likeness of the Father, substance of the Father, one with the Father, fed and renewed continually from the inexhaustible Good which is the Father. “In him we live, move and have our being.” At the circumference, where stagnation has taken place (which is man’s body), there is not much that looks God-like in any way. We get our eyes fixed on the circumference, or external of our being. We lose consciousness of the indwelling, ever active, unchanging God at the center, and we see ourselves sick, weak and in every way miserable. It is not until we learn to live at the center, and to know that we have power to radiate from that center this unceasing, abun- dant life, that we are well and strong and powerful. Jesus kept his eyes away from the external altogether, and kept his thoughts at the central part of his being, which was the Christ. “Judge not according to appearances,” he said, that is, according to the external, “but judge righteous judgment,” (John 7:24) according to the real truth, or from the Spirit. In Jesus, the Christ, or the Central Spark which was God, the same as lives in each of us today, was drawn forth to show itself perfectly over and above the body, or fleshly man. He did all his mighty works not because he was given some greater or different power from that which God has given us—not because he was in some different way a Son of God and we only children of God—but just because this same Divine Spark which the Father has implanted in every child born, had been fanned into a bright flame by his prenatal influences, early surroundings, and by his own later efforts in holding himself in constant conscious communion with the Father, the Source of all love, life and power. To be tempted does not mean to have things come to you which, however much they may affect others, do not at all affect you because of some superiority in you to them. It means to really be tried, to suffer and to have to make effort to resist. Paul speaks of Jesus as “one tempted in all points like as we are.” And Jesus himself confessed to having been tempted when he said to his disciples, “Ye are they which have continued with me in my temptations” (Luke 22:28). The humanity of the Nazarene “suffered being tempted,” or tried, just as much as you and I suffer today because of temptations and trials, and in exactly the same way. We know that during His public ministry Jesus spent hours of every day alone with God; and none of us know what he went through in all the years of his early manhood—just as you and I are doing today—in overcoming the mortal, his fleshly desires, his doubts and fears, until he came into the perfect recognition of this indwelling Presence, this “Father in me,” to whom he ever ascribed the credit of all his wonderful works. He had to learn as we are having to learn; he had to hold fast as we are having today to hold fast; he had to try over and over again to overcome as we are doing, or else he was not “tempted in all points like as ye are. We must all recognize, I think, that it was the Christ within which made Jesus what he was; and our power now to help ourselves and to help others, lies in our getting to comprehend the truth, for it is a truth whether we realize it or not, that this same Christ lives within us as it lived in Jesus. It is the part of himself which God has put within us, and which ever lives there with an inexpressible love and desire to spring to the circumference of our being, or to our consciousness, as our sufficiency in all things. “The Lord thy God in the midst of thee is mighty; he will save [or he wills to save] ; he will rejoice over thee with joy; he will rest in his love; he will joy over thee with singing” (Zeph. 3:17). This Christ within us is the “well beloved Son” the same as it was in Jesus. It is the “I in them, and thou in me, that they may be made perfect,” of which Jesus spoke. In all this we would detract nothing from Jesus. He is still our Savior in that he went through suffering unutterable, through the perfect crucifixion of self, that he might lead us to God; that he might show us the way out of our sin, sickness and trouble; that he might manifest the Father to us, and teach us how this same Father loves us and lives in us. We love Jesus and must ever love him with a love which is greater than all others, and to prove our love would follow his teachings and life closely. In no other way can we do this so perfectly as by trying to get at the real meaning of all that he said, and let the Father work through us as he did through him, our perfect Elder Brother and Savior. In speaking, Jesus sometimes spoke from the mortal part of him, but he lived so almost wholly in the Christ part of himself, so consciously in the center of his being, where the very essence of the Father was bubbling up in ceaseless activity, that he usually spoke from that part. “No man cometh unto the Father but by me,” means not that God is a stern Father whom we must coax and conciliate by coming to him through Jesus, his kinder, more easily entreated Son. Did not Jesus say, “He that hath seen me hath seen the Father”? or in other words, As I am in love and gentleness and accessibility, so is the Father. These words mean that no man can come to the Father except through the Christ part of himself. You cannot come around through some other person or by any outside way. Another may teach you how to come, and assure you of all that is yours if you do come, but you must retire within your own soul, find the Christ there and look to the Father through the Son for whatever you want. Jesus was always trying to get the minds of the people away from his personality, and to fix them on the Father in him as the source of all his power. 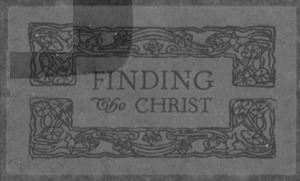 And when toward the last they were clinging so to his mortal self, because their eyes had not yet been opened to understand about the Christ within their own souls, he said, “It is expedient for you that I go away, for if I go not away the Comforter will not come;” that is, if he remained where they could keep looking to his personality all the time, they would never know that the same Spirit of Truth and Power lived within themselves. There is a great difference between a Christian life and a Christ life. A Christian life is following the teachings of Jesus, with the idea of God and Christ being wholly outside of us, to be called upon but not always to answer. A Christ life is the same following of Jesus’ teachings with the knowledge of God’s indwelling presence, which is always Life, Love and Power within us now ready and waiting to flow forth abundantly, aye, lavishly into our consciousness, and through us unto others the moment we open ourselves to it and trustfully expect it. One is a following after Christ, which is beautiful and good so far as it goes, but is always very imperfect; the other is letting Christ, the perfect Son of God, be manifested through us. One is expecting to be saved sometime from sin, sickness and trouble; the other is knowing we are in reality saved now from all these things through this indwelling Christ, and by faith we affirm it until the evidence is manifested in our bodies. Simply believing that Jesus died on the cross to appease God’s wrath never did or can save anyone from present sin, sickness or want, and was not what Jesus taught. “The devils believe and tremble,” we are told, but they are not saved thereby. There must be something more than this—a living touch of some kind, a sort of intersphering of our own souls with the Divine Source of all good and all giving. We are to have faith in the Christ, believe that the Christ lives in us, and is in us God’s Son; that this indwelling One has power to save and make us whole; aye, more, that he has made us whole already. For did not the Master say, “Whatsoever things ye desire when ye pray, believe that ye receive [present tense], and ye shall have them”? If, then, you are manifesting sickness, you are to ignore the seeming— which is the external, or circumference of the pool where the water is stagnant and the scum has arisen—and speaking from the center of your being, say: “This body is the temple of the living God; the Lord is now in his holy temple; Christ in me is my life, Christ is my health, Christ is my strength, and Christ is perfect; therefore, I am now perfect because he dwelleth in me as perfect life, health, strength.” Say the words with all earnestness, trying to realize what you are saying, and almost immediately the perennial Fountain of Life at the center of your being will begin to bubble up and continue with rapidly increasing activity until new life will radiate through pain, sickness, sores, all diseases, to the surface, and your body will show forth the perfect life of Christ. Nowhere in the New Testament is the idea conveyed that Jesus Christ came that there might be after death a remission of the penalty for sin. That idea is a pure fiction of man’s ignorant, carnal mind of later date. In many places in the biblical record reference is made to “remission of sins;” and Jesus himself, according to Luke’s record, said that “repentance and remission of sins should be preached in his name among all nations.” “Sins,” in the original text, does not mean crime deserving punishment. It means any mistake or failure which brings suffering. Christ came that there might be remission or cessation of sins, of wrongs, of mistakes, which were inevitably followed by suffering. He came to bring “good tidings of great joy to all people.” Tidings of what? Tidings of salvation. When? Where? Not salvation from punishment after death, but salvation from the mistakes and failures here and now. He came to show us that God, our Creator and Father, longs with yearnings unutterable to be to us, through the Christ, the abundance of all things we need or desire. But our part is to choose to have him, and after we have chosen to “hold fast till he comes.” Not till he comes after death, but just to hold steadily to our faith until he manifests himself. For instance, in thus looking to him for health, when by an act of your will you stop looking to any material source (and this is not always easy to do), and declare the Christ in you to be the only life of the body, and it always perfect life, it needs but that you hold steadfastly, without wavering, to the thought in order to become well. And when once you have put any matter into the hands of this indwelling, ever-present Christ, in whom there is at all times an irrepressible desire to spring to our rescue and to do all things for us, to work out, do not dare to take it back into your mortal hands again to work out for yourself, for by so doing you simply put off the time of his bringing it to pass. All you have to do in the matter is to hold to the thought, “It is done. It is manifest now.” This Divine Presence is our sufficiency in all things, and will materialize itself as such in whatever we need or desire if we but trustfully expect it. If we want this Father within, which is the Christ, to manifest himself as all things through us, we must learn to keep the mortal of us still—to still all its doubts and fears and false beliefs— and to hold rigidly to the “Christ only.” In his name we may speak the words of healing, of peace and deliverance to others, but as Jesus said of himself, so we must also say of ourselves, “Of mine own self [that is, of the mortal], I can do nothing; the Father in me, he doeth the works.” He is the ever-present Power to overcome all things, be they sickness, weakness, ignorance or whatever. We claim this Power, or bring it into our consciousness where it is of practical use, by declaring over and over again that it is ours already. Saying, and trying to realize what we are saying, “Christ is my wisdom, hence I know truth,” will in a short time make us understand spiritual things better than months of study will do. Saying, “Christ is my strength, I cannot be weak or frail,” will make us strong enough for any emergency. Remember, we do not begin by feeling these things at first, but by earnestly and faithfully saying them, and acting as though they were so—and this is the faith which brings the Power into manifestation. The Christ lives in us always. God, the Creative Energy, sent his Son first, even before the body was formed, and he ever abides within, “the firstborn of every creature.” But it is with us as it was with the ship on the tempestuous sea after the storm arose. Jesus being in the vessel did not keep it from rocking or the angry waves from beating against it, for he was asleep. It was only after he was awakened and brought out to manifest his power that the sea became still and the danger was over. The Christ in us has been there all the time, but we have not known it, and so our little ships have been tossed about by sickness and poverty and distrust until we have seemed almost lost. I, the true spiritual self of me, am one with this Christ. You, the true spiritual self of you, are one with this Christ. The true self of every person is the child of God, made in his image. “Beloved, now are we sons of God, and it doth not yet appear what we shall be, but we know that when he shall appear, we shall be like him.” Now, already, are we the sons, and when he shall appear, that is, not when sometime after the transition called death, he, some great, glorious being, shall burst upon our view, but when we have learned to still the mortal of us and let the Father manifest himself at our surface, through the indwelling Christ, then we shall be like him, for he only will be visible through us. “Behold, what manner of love the Father hath bestowed upon us that we should be called the sons of God.” We are not simply reflections or images of God, but expressions (from ex, out of, and premere, pressum, to press or force), hence a forcing out of God, the All-Good, the All-Perfect. We are projections of the Invisible Presence into visibility. God made man one with the Father, even as Jesus was; and just in proportion as we recognize this and claim our birthright, the Father in us will be manifested to the world. Most of us have an innate shrinking from saying, “Thy will be done.” Because of false teaching and from associations we have believed that this prayer, if answered, would take away from us all that gives us joy or happiness. Surely nothing could be further from the truth. Oh, how we have tried to crowd the broad love of God into the narrow limits of man’s mind! The grandest, most generous, loving father that ever lived is but the least bit of God’s fatherhood manifested through the flesh. God’s will for us means more love, more purity, more power, more joy in our lives every day. No study of spiritual things or material, no effort though it be superhuman on our part, could ever begin to make of us the grand, God-like creatures, showing forth the same limitless soul which Jesus showed, as just praying continually the one prayer, “Thy will be done in me,” for the Father’s will is to manifest his perfect Being through us. “Among the creatures one is better than another, according as the Eternal Good manifesteth itself and worketh more in one than in another. Now that creature in which Eternal Good most manifesteth itself, shineth forth, worketh, is most known and loved, is the best; and that wherein the Eternal Good is least manifested, is least of all creatures” (Theologia Germanica, chapter six). “It pleased the Father that in Christ should all fullness dwell” —fullness of love, fullness of life, fullness of joy, of power, of All Good. “And ye are complete in him.” Christ in us, one with us, so we may boldly and with confidence say, “In Christ all things are mine.” Declaring it will make it manifest. But above all things else learn to keep to the Christ within yourself, not that within somebody else. Let the Father manifest through you in his own way, though it differ from that of every other child of his. Heretofore even the most spiritually enlightened of us have been mere pygmies, because we have by the action of our conscious thought limited the Divine manifestation to make it conform to the manifestation through some one else. God will make of us spiritual giants if we will but take away all limits and give him an opportunity. “Although it be good and profitable that we should learn and know what great and good men have wrought and suffered, and how God hath dealt with them, and wrought in them and through them, yet it were a thousand times better that we should in ourselves learn and perceive and understand who we are, how and what our own life is, what God is doing in us, and what he will have us do.” (Theologia Germanica, chapter nine). It needs but the one other little word, now, firmly and persistently held in the mind, to bring into manifestation through us the highest ideal we are capable of forming; aye, far higher, for does it not say, “As the heavens are higher than the earth, so are my ways higher than your ways, and my thoughts than your thoughts”? And this manifestation through us will be the fulfillment of God’s ideal instead of our limited, mortal ideal, when we learn to let the Spirit lead and to hold our conscious minds to the Now. You want to manifest the perfect Christ. Affirm with all your heart, and soul, and strength that you do so manifest now; that you manifest health, and strength, and love, and truth, and power. Let go the notion of being or doing anything in future. God knows no time but the Eternal Now. You can never know any other time, for there is no other. You cannot live an hour or ten minutes in the future. You cannot live it until you reach it, and then it becomes the Now. Saying or believing salvation and deliverance are to be, will forever and through all the eternal ages keep them, like a will-o’-the-wisp, just a little ahead of you, always to be reached but never quite realized. from our distresses after death, but always taught a present salvation. Christ now. And whatever we persistently declare is done now, is manifested now, we will see fulfilled. Unity School of Christianity, Kansas City, Missouri, publishes Unity Magazine, a monthly periodical, devoted to Practical Christianity and Christian Healing. Subscription price is 10 cents a copy; $1.00 a year.